From this article we will share the best way to play Blu-ray on Panasonic 4K TV & Smart TV, you will get the best Blu-ray to Panasonic 4K TV Converter, which can rip Blu-ray to Panasonic 4K TV supported format, and then you can copy Blu-ray to USB Flash Drive for Panasonic TV playback. Panasonic 4K TV and Smart TV are very hot, the screen is vivid and the hardware is excellent, Panasonic TVs have attracted a lot of users. Have you bought a Panasonic 4K TV or Smart TV to replace your old TV? Maybe you have already bought a Panasonic 4K TV or Smart TV, but how to play Blu-ray on Panasonic 4K TV & Smart TV? In this article, we will share the best Blu-ray to Panasonic TV converter with you, it will rip Blu-ray movies to Panasonic 4K TV and Smart TV supported format, and then you can play Blu-ray on Panasonic 4K TV and Smart TV through USB or other devices with compatible format, it can also help you to convert and play DVD on Samsung 4K TV or Panasonic TV. As we know Blu-ray disc movies are not supported by Panasonic 4K TV & Smart TV directly, so if we need to play Blu-ray on Panasonic 4K TV & Smart TV, the best way is to convert Blu-ray to supported format and then stored on USB Flash Drive or NAS devices, and then play Blu-ray on Panasonic 4K TV & Smart TV from USB, you can learn Panasonic LED/4K TV supported video formats from USB in this article. 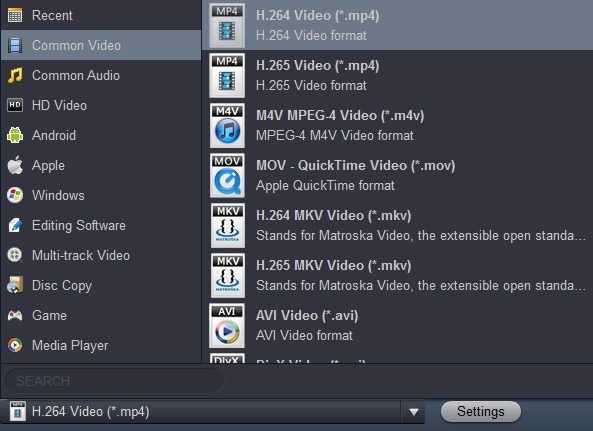 To convert Blu-ray movies to Panasonic TV supported format, we recommend you to use Acrok Video Converter Ultimate Mac or Windows version, this is the best Blu-ray Ripper on the market, which can rip latest Blu-ray and DVD movies to any unprotected common videos, it can also convert HD videos for you, now please download this Blu-ray to Panasonic 4K TV Converter from the link below. 1. Free download Acrok Video Converter Ultimate Mac or Windows version from the product page, install this software on your computer, launch it as the best Blu-ray to 4K TV Converter. 2. Please click “Load Disc” button to import Blu-ray movies that you want to convert, Blu-ray disc, Blu-ray ISO, Blu-ray folder, DVD disc, DVD ISO/IFO, DVD folder and HD videos are all supported. 3. Please choose output format. Click format column and choose Panasonic 4K TV & Smart TV supported format, we recommend you to choose Common Video -> MP4 Video (*.mp4), this format is well supported by many HD TVs. Besides MP4 format, you can also choose other formats according to your need. 4. Click convert button on the main interface to start the Blu-ray to Panasonic 4K TV & Smart TV conversion process. 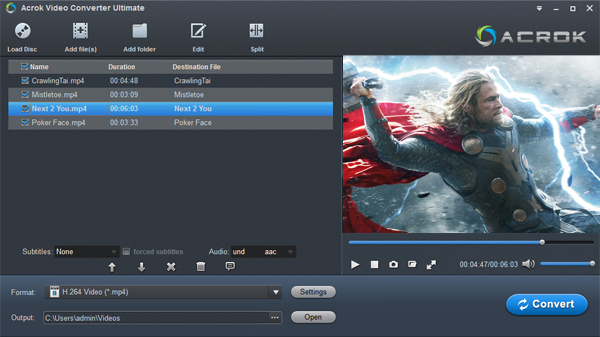 Acrok Video Converter Ultimate will rip Blu-ray movies at fast speed, NVIDIA CUDA and AMD APP acceleration is supported by this software, so it will save much time for you, when your Blu-ray movies are converted, you can import converted blu-ray movies to USB Flash Drive, Pen drive or NAS, and then you can play Blu-ray on Panasonic 4K TV & Smart TV with compatible format, there is no protection anymore. You can also use it as 4K Video Converter for Mac to convert 4K videos to other formats you need.